"The Worst Inning of Baseball I've Ever Seen" ~ The Bucky Channel - The World of Sports from Wisconsin's Perspective. 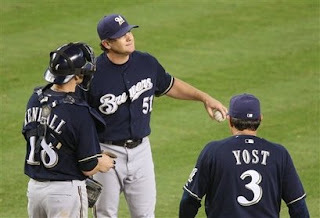 Home » Arizona Diamondbacks , Bill Simmons , Brian Shouse , Eric Gagne , Guillermo Mota , J.J Hardy , Jason Kendall , Manny Parra , Milwaukee Brewers , Ned Yost , Salomon Torres » "The Worst Inning of Baseball I've Ever Seen"
"The Worst Inning of Baseball I've Ever Seen." Those were the words uttered by my friend Wavs (and yes, I am trying to be like Bill Simmons by talking to you about my friends as if you know them) after the 9th inning in the Brewers 6-5 loss against the Diamondbacks on Thursday. Coming into the inning with a 5-0 lead, the Brewers gave up six runs, and the game, without collecting a single out. This was one of those games where you think you've put it away early, and already count on the victory in the win column. But, as we saw today, if you think one way for a second, the reverse is sure to happen. That's just baseball. Guillermo Mota has been struggling, that's no secret. He loaded the bases up in the 9th, and was relieved by Brian Shouse. I read somewhere today that Shouse is the Brewers' most reliable reliever in a crucial situation, but that was not the case today, as he gave up a double that brought all of Mota's runners home. So who would we turn to? It had to be Salomon Torres, who is tied with Francisco Rodriguez in saves since Torres entered into the closers role. Didn't it? Not today, as he gave up the final three runs and the Brewers lost a heartbreaker. An uncharacteristically bad outing from the stalwarts of the bullpen cost us the victory today. But hey, Gagne pitched a scoreless inning in the 8th (and will likely relieve Mota of his set-up duties, one would think). Bright spots for the Brewers were the 4 for 5 with an HR day out of J.J. Hardy, and the six scoreless from Manny Parra. A tough loss, but not much you can do about it. The Brewers will try to redeem themselves Friday in Milwaukee, hosting a 4th of July matinee against the Pirates at 1:05. TBC's Player of the Game: Parra pitched great, but we're going to ride the J.J. Hardy hot streak while it's here. This honor is mainly given to Hardy because I picked him up in fantasy when I saw him at the plate. Two pitches later he hit a home run. Welcome to the team, J.J.!